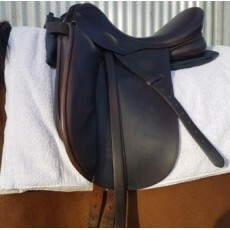 Small 37 cm wide 52 cm long to fit saddle 15 inch to 15.5 inch or pony saddle. Large 37 cm wide 60 cm long to fit jumping saddles large dressage saddles. Enjoy The Comfort of an Air Step Saddle Pad. Highly absorbing compressed rubber with air cells. Saddle fitting is essential for protecting your horses' back. I use one saddle on all my horses and I use this Air Step Saddle pad to distribute the pressure evenly on each horse. I have been using my saddle pad for my whole riding career. In the period I was eventing, we did not have saddle fitters, numerous saddle designs to choose from. I always had skinny off the track thoroughbred and only one dressage saddle and one jumping saddle. I designed this saddle pad to fit my saddle to any horse by using the air step pads to lift and elevate the saddle from my horse's back. I have never had a horse suffer from back pain due to a pressure area from my saddle. I still use the same pad today and actually the same jumping saddle. I have bought a new dressage saddle after 35 years. The Air Step Saddle pad has two layers of compressed rubber with woven air cells to move and absorb pressure. It will lift your saddle off your horse's back and provide a cushion between you and your horse. It is non-compressable, therefore it continues to absorb pressure ongoing. It will not flatten and lose shape. It will maintain its absorbing quality for many years. The cover is made from black vinyl for strength and longevity. It is easy to throw on your horse, no special adjustments required. If your saddle has been fitted then this saddle pad will not interfere with the fitting, it will only provide more absorbing qualities. It provides a platform to insert pads to elevate the back of the saddle if your saddle sits low behind. I can make a pad with a pocket to inserts pads. I have three sizes available. Medium- Measures 37cm wide by 57 cm long. This will fit a dressage saddle 16 to 16 1/2 inch long. Large -Measures 37cm wide by 60 cm long. This will fit a dressage saddle 17 to 171/2 inch saddle and all jumping saddles. Your saddle pad must be longer than your saddle so you don't have any lines of pressure from your weight. Your saddle pad must be longer than your saddle so you don't have any lines of pressure from your weight. Measure your saddle from the cantle to the pommel and choose the best size to fit your saddle. If you are unsure choose the larger size.